The recent American Literature Association War and Literature conference in New Orleans placed the contemporary war lit scene under sharp academic focus. On the fiction side, papers and panels addressed works such as Ben Fountain’s Billy Lynn’s Long Halftime Walk and Helen Benedict’s Sand Queen. 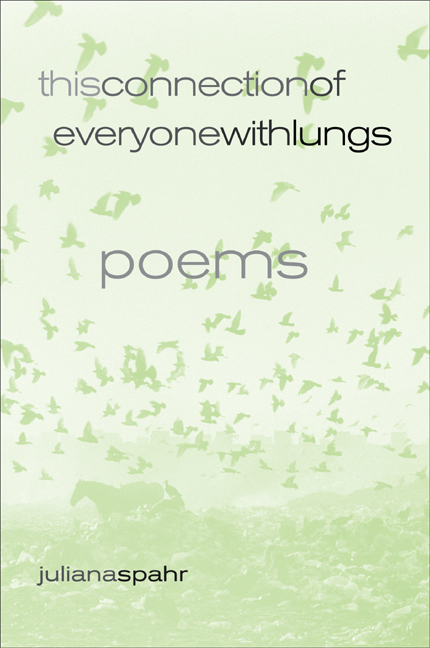 Regarding poetry, Brian Turner as might be expected received a fair amount of scrutiny, but non-veteran Juliana Spahr’s 2005 collection This Connection of Everyone with Lungs seemed the most enticing object of attention among the assembled scholars. Looking back, we might remember that the publication of This Connection of Everyone with Lungs in 2005 was a major event in the poetry world—an important statement on war by a poet who mattered. Spahr established herself as a talented, imaginative, and daring poet in the 90s, and her book of criticism, Everybody’s Autonomy: Connective Reading and Collective Identity (2001) had been well-received among the cutting-edge poetry crowd. The two long poems that make up This Connection of Everyone with Lungs, “Poem Written after September 11, 2001” and “Poem Written from November 30, 2002, to March 27, 2003,” were first published in a number of small print and online journals, and now, in 2005, their appearance in one volume asserted a formidable poetic way of understanding and dealing with the facts of national trauma and global war. Spahr’s credentials as a leftist-postmodernist-feminist artist and critic were impeccable, and now her poetry brought these cognitive, ethical, and political predilections to bear against the weightiest of game-changing world events. Spahr tells us she wrote “Poem Written after September 11, 2001” in Brooklyn. Though we don’t know if Spahr was in New York on 9/11, we feel the force of the poet’s physical proximity to lower Manhattan urging her to connect her own feelings about the attacks, colored by her own national identity and anti-war politics, with a global consciousness in a relationship not permeated by fury, fear, and greed. A short note before “Poem Written from November 30, 2002 to March 27, 2003,” reveals that Spahr’s physical place of writing—in this case, Hawaii—was also important to her while crafting this long poem. Reflecting her dismay at hearing the news of the invasions of Iraq and Afghanistan, she writes, “I felt I had to think about what I was connected with, and what I was complicit with, as I lived off the fat of the military-industrial complex on a small island.” She goes on to say that it was “[t]his feeling made lyric” that energize the long poem that follows, but warns, “I gained no sophisticated understanding as I wrote….” Instead, the poem evokes sensations, moods, and halting stabs at intuition and epiphany, with no real resolution at the end of 64 pages. Trying to figure out the war from news reports, the most she can conclude explicitly is that the war has been profoundly unsettling. Exactly how is one supposed to feel? Exactly what is the effect of the war on the national populace not charged with exactly fighting it? Eschewing grand conclusions, moral indignation, and political screeds, she tries to measure the impact in personal terms that are neither hyperbolic nor trivial and mundane. During the bombing, beloveds, our life goes on as usual. Oh the gentle pressing of our bodies together upon waking. Oh the parrots and their squawking. Oh the soft breeze at five to ten miles per hour. Oh the harsh sun and the cool shade. Oh the papaya and yogurt with just a little salt for breakfast. Oh the cool shower that we take together. This makes us feel guiltier and more unsure of what to do than ever. We watch it all happen on television. We go to protests as they happen. The odd “beloveds” illustrate how, befitting her interest in postmodern expression and the decentered subject, Spahr bends and twists conventional usage to fit her message. The most noticeable stylistic tic is her use of plural forms of address in places where convention would have her addressing a single listener. For example, the opening line of the poem is “Beloveds, we wake up in the morning to darkness and watch it / turn into lightness with hope.” Later, she writes, “Beloveds, yours skins is a boundary separating yous from the rest / of yous.” I’m not naïve enough not to recognize Spahr has little interest in placating readers’ conventional tastes, but I won’t kid you, either; this technique is distracting. A line such as, “We slept soundly during the night, beloveds, and when I woke / yous were wrapped around me….” is fine by me without the linguistic embellishment. And it goes on and on all day long and then we go to bed. Lincoln, unmanned aerial vehicles, and surveillance. The most certain thing we might be able to say is that after a decade of war “all of us” are with a lot more of “all of that”—a vastly expanded vocabulary of military technical and operational terms and soldier slang. But what else? We might contemplate Spahr’s need for connection as an impulse intensified by post-9/11 jittery-ness and exacerbated by millennial-age status anxiety and computerized possibilities for contact. Or, she might be pointing us to the collapse of older stances and perspectives viz-a-viz war, national militarism, and soldiers and soldiering. A redefining of the civil-military divide, if you will, that is true to her politics and yet in keeping with the times. Let’s acknowledge Spahr for being on to something–both in 2005 and now–and remain alert for future reports from the academic community as to how and why. Juliana Spahr’s This Connection of Everyone with Lungs was published in 2005 by the University of California Press. This entry was posted on November 28, 2013 at 2:06 pm and is filed under Art and War. You can subscribe via RSS 2.0 feed to this post's comments.